DIE Jovis, videlicet, 19 die Maii. 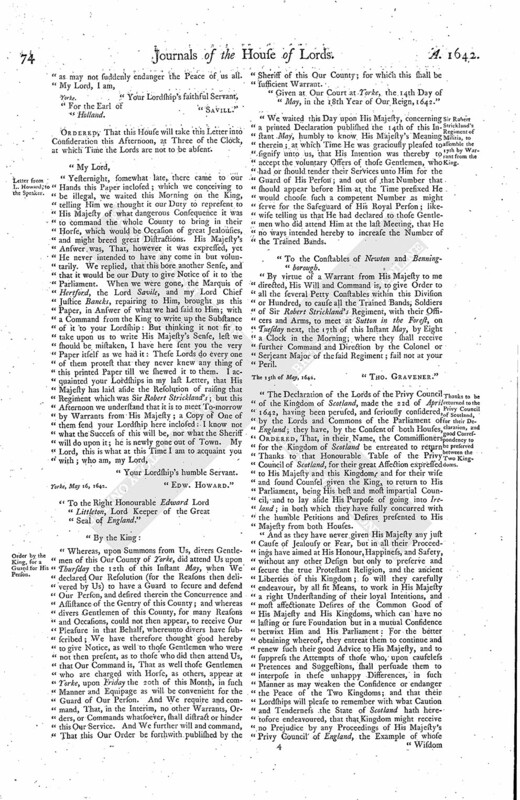 Message from the H. C. with a Bill for a Synod to settle the Doctrine of the Church. Declaration to be sent to Scotland. Order for 1500L. to Mr. Loftus. For Counsel to Lord Kymbolton and the others. For a Conference about the Charge against the Recorder; and about bringing up the Army. and for putting in Execution the Ordinance for the Militia. Trained Bands to be mustered on Thursday. Committee to put in Execution the Ordinance for the Militia. E. of Leicester Warrant from the King, to levy 4000 Men for Ireland. and to the Order for 1500£. to Mr. Loftus. and for Committees to meet to put in Execution the Ordinance for the Militia. Message from the H. C. with an Order about the Declarations to be sent to Scotland. Letter from L. Howard, to the L. Keeper. The Person who brought the King's Letter to Skippon to attend. Letter from L. Savill, to the E. of Holland. Letter from L. Howard, to the Speaker. Order by the King, for a Guard for His Person. Sir Robert Strickland's Regiment of Militia, to assemble the 17th by Warrant from the King. Thanks to be returned to the Privy Council of Scotland, for their Declaration, and good Correspondency to be preserved between the Two Kingdoms. L Kymbolton and the others to proceed against the Attorney General for Damages. Examinations to be printed with the Declaration. Habeas Corpus to bring up the Messenger imprisoned at York. Message to the H. C. for a Conference about a Breach of Privilege. To prevent the Dangers and Distractions of the Kingdom. L. Admiral to transport Horses. Delinquents to be brought to deserved Punishment. The Lord Privy Seal was appointed by this House to sit Speaker this Day. A Message was brought from the House of Commons, by Mr. Marten; who brought from the House of Commons, 1. a Bill, intituled, "An Act for the calling of Divines, to settle the Doctrine of our Church." "2. A Declaration for to be sent into Scotland, desiring their Lordships Concurrence therein." "3. An Order for paying to Mr. Loftus Fifteen Hundred Pounds for Ireland. "5. To desire a Conference, by a Committee of both Houses, concerning the Charge against the Recorder of London, and touching the Depositions concerning the bringing up of the Army against the Parliament to be added to the last Declaration. "6. To desire their Lordships to give Expedition to the last Declaration brought up from the House of Commons. "7. That their Lordships would join with the House of Commons, that a select Committee of both Houses may be appointed, to consider how to put the Ordinance of both Houses of Parliament concerning the Militia into speedy Execution." The Earl of Bristoll, being sick, was excused for being absent this Day. That their Lordships are now in Hand with the Declaration lately brought, and will give Expedition therein. As for the other Particulars in the Message, their Lordships will take them into Consideration, and send an Answer by Messengers of their own. Next, the rest of the Declaration was read, which was left Yesterday. It was Resolved, To pass as it is. Ordered, That this Declaration shall be forthwith printed and published. Ordered, That this House agrees with the House of Commons in this Declaration, and that it shall be sent into Scotland, to the Council there. The Earl of Holland and the Lord Kymbolton reported to this House, "That they had acquainted the City with their Lordships Thanks." The Earl of Holland likewise acquainted this House, That the Deputy Lieutenants hath informed him, that they shall not be ready to muster the Trained Bands until Thursday next;" which this House Ordered it should be then accordingly done. (fn. 1) L. Viscount Say. Ds. Robartes. Any Four of their Lordships to meet when they please. The Earl of Leycester acquainted this House with a Warrant, which he hath received from the King, to levy Four Thousand Voluntiers, to be sent for the Affairs of Ireland; which being read, was Ordered to be referred to the Commissioners for Ireland. 1. To let them know, that this House hath agreed with them in the Declaration to the Kingdom; and their Lordships have Ordered the same to be printed and published. 2. That their Lordships do agree with the House of Commons in the Declaration to be sent to the Council of Scotland. 3. Their Lordships do agree with the House of Commons in the Order for Fifteen Hundred Pounds to be paid to Mr. Loftus. 4. That their Lordships are ready to give a present Conference, as they have desired. 5. To let them know, that their Lordships have appointed Twelve Lords, or any Four of them, to meet when they please, to join with a Committee of the House of Commons, to put the Militia into Execution. That they have delivered the several Papers to the House of Commons; and the House of Commons will appoint a Committee, to meet with a Committee of this House, for putting the Militia into Execution. And the House of Commons will give a present Conference, as is desired. To desire their Lordships Concurrence in an Order made by the House of Commons. "It is this (fn. 2) Day Ordered, by the Lords and Commons, That the Commissioners of both Houses appointed to treat with the Scotts Commissioners shall deliver unto the Scotts Commissioners true Copies of the Declarations passed by both Houses, to be sent in Answer to the Declaration from the Council of Scotland, and likewise of the Declarations at large passed both Houses; and desire them, in the Name of both Houses, to send them forthwith to the Council of Scotland." Ordered, That this House agrees with the House of Commons in this Order, and refers it to the Lords Committees to deliver the same to the Scotts Commissioners, to go at what Time they think fit; but the Committees of both Houses to go together. A Letter written from the Lord Howard to the Lord Keeper, with Papers inclosed, were read. Ordered, That the Gentleman Usher shall send a Messenger to Serjeant Major General Skippon, to know of him who it was that brought him the Letter to command him to go to Yorke; and that the Party shall have Notice to attend this House this Afternoon. "For the Earl of Holland. Ordered, That this House will take this Letter into Consideration this Afternoon, at Three of the Clock, at which Time the Lords are not to be absent. "To the Right Honourable Edward Lord Littleton, Lord Keeper of the Great Seal of England." "Whereas, upon Summons from Us, divers Gentlemen of this Our County of Yorke, did attend Us upon Thursday the 12th of this Instant May, when We declared Our Resolution (for the Reasons then delivered by Us) to have a Guard to secure and defend Our Person, and desired therein the Concurrence and Assistance of the Gentry of this County; and whereas divers Gentlemen of this County, for many Reasons and Occasions, could not then appear, to receive Our Pleasure in that Behalf, whereunto divers have subscribed; We have therefore thought good hereby to give Notice, as well to those Gentlemen who were not then present, as to those who did then attend Us, that Our Command is, That as well those Gentlemen who are charged with Horse, as others, appear at Yorke, upon Friday the 20th of this Month, in such Manner and Equipage as will be convenient for the Guard of Our Person. And We require and command, That, in the Interim, no other Warrants, Orders, or Commands whatsoever, shall distract or hinder this Our Service. And We further will and command, That this Our Order be forthwith published by the Sheriff of this Our County; for which this shall be sufficient Warrant. "Given at Our Court at Yorke, the 14th Day of May, in the 18th Year of Our Reign, 1642. "We waited this Day upon His Majesty, concerning a printed Declaration published the 14th of this Instant May, humbly to know His Majesty's Meaning therein; at which Time He was graciously pleased to signify unto us, that His Intention was thereby to accept the voluntary Offers of those Gentlemen, who had or should tender their Services unto Him for the Guard of His Person; and out of that Number that should appear before Him at the Time prefixed He would choose such a competent Number as might serve for the Safeguard of His Royal Person; likewise telling us that He had declared to those Gentlemen who did attend Him at the last Meeting, that He no ways intended hereby to increase the Number of the Trained Bands. "To the Constables of Newton and Benningborough. "By virtue of a Warrant from His Majesty to me directed, His Will and Command is, to give Order to all the several Petty Constables within this Division or Hundred, to cause all the Trained Bands, Soldiers of Sir Robert Strickland's Regiment, with their Officers and Arms, to meet at Sutton in the Forest, on Tuesday next, the 17th of this Instant May, by Eight a Clock in the Morning; where they shall receive further Command and Direction by the Colonel or Serjeant Major of the said Regiment; fail not at your Peril. 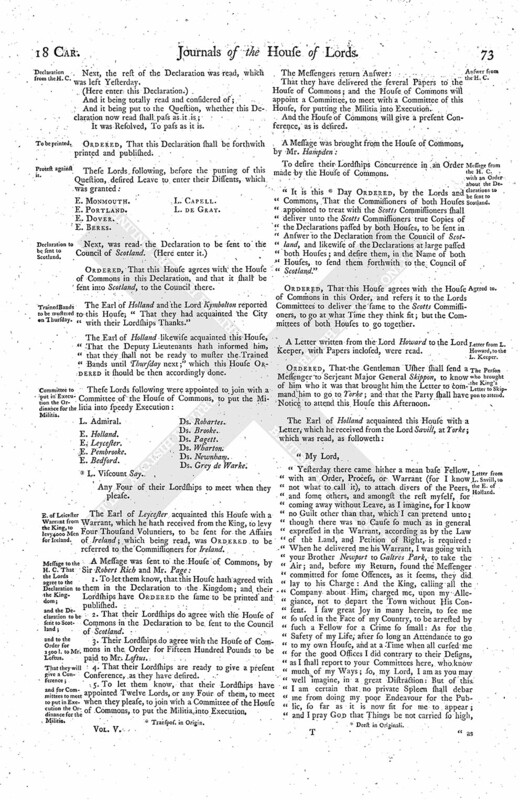 "The Declaration of the Lords of the Privy Council of the Kingdom of Scotland, made the 22d of April 1642, having been perused, and seriously considered, by the Lords and Commons of the Parliament of England; they have, by the Consent of both Houses, Ordered, That, in their Name, the Commissioners for the Kingdom of Scotland be entreated to return Thanks to that Honourable Table of the Privy Council of Scotland, for their great Affection expressed to His Majesty and this Kingdom, and for their wise and sound Counsel given the King, to return to His Parliament, being His best and most impartial Council, and to lay aside His Purpose of going into Ireland; in both which they have fully concurred with the humble Petitions and Desires presented to His Majesty from both Houses. 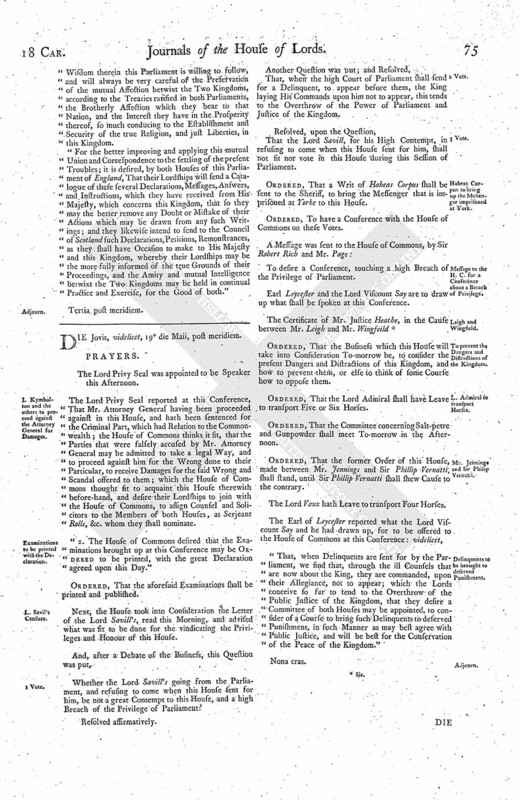 "And as they have never given His Majesty any just Cause of Jealousy or Fear, but in all their Proceedings have aimed at His Honour, Happiness, and Safety, without any other Design but only to preserve and secure the true Protestant Religion, and the ancient Liberties of this Kingdom; so will they carefully endeavour, by all fit Means, to work in His Majesty a right Understanding of their loyal Intentions, and most affectionate Desires of the Common Good of His Majesty and His Kingdoms, which can have no lasting or sure Foundation but in a mutual Confidence betwixt Him and His Parliament: For the better obtaining whereof, they entreat them to continue and renew such their good Advice to His Majesty, and to suppress the Attempts of those who, upon causeless Pretences and Suggestions, shall persuade them to interpose in these unhappy Differences, in such Manner as may weaken the Confidence or endanger the Peace of the Two Kingdoms; and that their Lordships will please to remember with what Caution and Tenderness the State of Scotland hath heretofore endeavoured, that that Kingdom might receive no Prejudice by any Proceedings of His Majesty's Privy Council of England, the Example of whose Wisdom therein this Parliament is willing to follow, and will always be very careful of the Preservation of the mutual Affection betwixt the Two Kingdoms, according to the Treaties ratified in both Parliaments, the Brotherly Affection which they bear to that Nation, and the Interest they have in the Prosperity thereof, so much conducing to the Establishment and Security of the true Religion, and just Liberties, in this Kingdom. 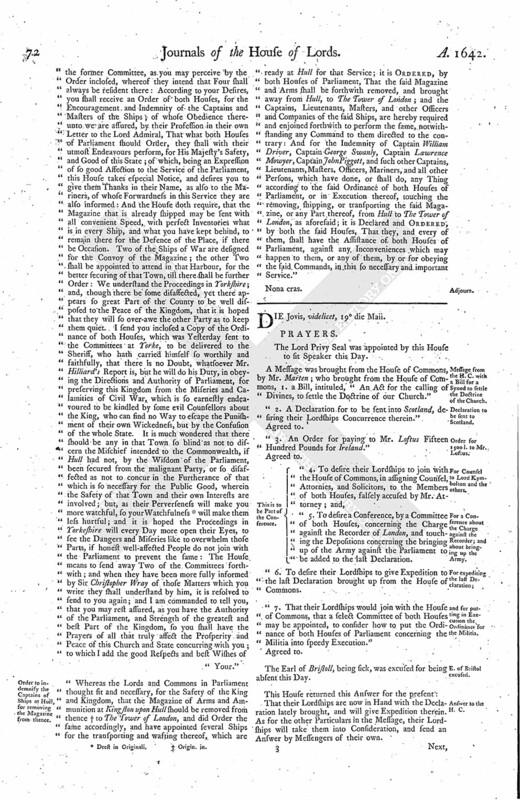 For the better improving and applying this mutual Union and Correspondence to the settling of the present Troubles; it is desired, by both Houses of this Parliament of England, That their Lordships will send a Catalogue of these several Declarations, Messages, Answers, and Instructions, which they have received from His Majesty, which concerns this Kingdom, that so they may the better remove any Doubt or Mistake of their Actions which may be drawn from any such Writings; and they likewise intend to send to the Council of Scotland such Declarations, Petitions, Remonstrances, as they shall have Occasion to make to His Majesty and this Kingdom, whereby their Lordships may be the more fully informed of the true Grounds of their Proceedings, and the Amity and mutual Intelligence betwixt the Two Kingdoms may be held in continual Practice and Exercise, for the Good of both." The Lord Privy Seal was appointed to be Speaker this Afternoon. The Lord Privy Seal reported at this Conference, That Mr. Attorney General having been proceeded against in this House, and hath been sentenced for the Criminal Part, which had Relation to the Commonwealth; the House of Commons thinks it fit, that the Parties that were falsely accused by Mr. Attorney General may be admitted to take a legal Way, and to proceed against him for the Wrong done to their Particular, to receive Damages for the said Wrong and Scandal offered to them; which the House of Commons thought fit to acquaint this House therewith before-hand, and desire their Lordships to join with the House of Commons, to assign Counsel and Solicitors to the Members of both Houses, as Serjeant Rolls, &c. whom they shall nominate. "2. The House of Commons desired that the Examinations brought up at this Conference may be Ordered to be printed, with the great Declaration agreed upon this Day." Ordered, That the aforesaid Examinations shall be printed and published. Next, the House took into Consideration the Letter of the Lord Savill's, read this Morning, and advised what was fit to be done for the vindicating the Privileges and Honour of this House. Whether the Lord Savill's going from the Parliament, and refusing to come when this House sent for him, be not a great Contempt to this House, and a high Breach of the Privilege of Parliament? That, when the high Court of Parliament shall send for a Delinquent, to appear before them, the King laying His Commands upon him not to appear, this tends to the Overthrow of the Power of Parliament and Justice of the Kingdom. That the Lord Savill, for his High Contempt, in refusing to come when this House sent for him, shall not fit nor vote in this House during this Session of Parliament. Ordered, That a Writ of Habeas Corpus shall be sent to the Sheriff, to bring the Messenger that is imprisoned at Yorke to this House. Ordered, To have a Conference with the House of Commons on these Votes. To desire a Conference, touching a high Breach of the Privilege of Parliament. Earl Leycester and the Lord Viscount Say are to draw up what shall be spoken at this Conference. Ordered, That the Business which this House will take into Consideration To-morrow be, to consider the present Dangers and Distractions of this Kingdom, and how to prevent them, or else to think of some Course how to oppose them. Ordered, That the Lord Admiral shall have Leave to transport Five or Six Horses. Ordered, That the Committee concerning Salt-petre and Gunpowder shall meet To-morrow in the Afternoon. Ordered, That the former Order of this House, made between Mr. Jennings and Sir Phillip Vernatti, shall stand, until Sir Phillip Vernatti shall shew Cause to the contrary. The Lord Vaux hath Leave to transport Four Horses. "That, when Delinquents are sent for by the Parliament, we find that, through the ill Counsels that are now about the King, they are commanded, upon their Allegiance, not to appear; which the Lords conceive so far to tend to the Overthrow of the Public Justice of the Kingdom, that they desire a Committee of both Houses may be appointed, to consider of a Course to bring such Delinquents to deserved Punishment, in such Manner as may best agree with Public Justice, and will be best for the Conservation of the Peace of the Kingdom."